I wrote about PeerStreet for the first time back in March of 2017 after I had been invited to visit their HQ and interview their founders. Since then I have aggressively grown my investment accounts with them in a little less than five months. I want to take a deeper dive into the platform and the investments I’m holding in one of my two accounts (it’s a self-directed IRA). One thing I have noticed is that new investments come in waves and it does take some time to become fully invested. The hard money lending space is a $16B market, according to the founders of PeerStreet, and they are constantly working on the supply of loans for investors. I can appreciate their challenge of doing this as a new platform, with a growing user base, in a way that does not diminish the quality of the investments that make it through the funnel. You can set up automated investing (what I do now). I’m confident that if I would have been open to longer-term loans that the time to become fully invested would have been less than three weeks. 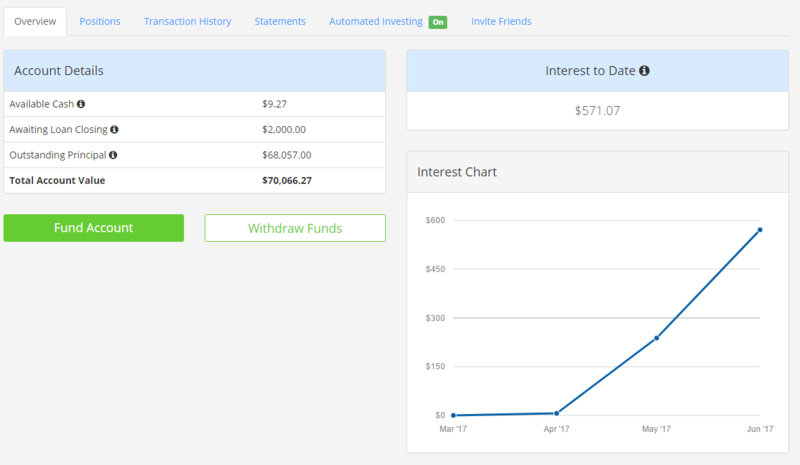 On the dashboard, you get a nice overview of your account along with a chart that shows you how much interest you have collected to date. You can see the lag time between when I opened my account sometime in March, to when interest started trickling in in April and building through June. Based on the mix of my current investments, I should be collecting about $400/month in interest. Speaking of the mix of my investments, let’s take a look under the hood. When I first started writing this post, I was going to just take a screenshot directly from the “Positions” tab in the dashboard I shared above, but then realized that there were a few metrics that I wanted to be able to track and share with all of you. So I exported the positions to Excel and added the information I wanted to see and show. I should point out that I chose to use $2,000 per loan based on the size of my account. As I mentioned above, I opened this account with $50,000, and I decided that I didn’t want any one loan to make up more than 5% of the portfolio. At the time, this put each loan at 4% of the total portfolio value. Since then I invested another $19,000 and some change, which has diluted the size of each loan to about 2.8% of the total portfolio value. LTV – You get to see the LTV on the investment page, but for some reason, the developers have not carried this over to the positions page once it becomes an investment. I brought this in not only to see what the individual LTV’s were for each loan but because I also wanted to see what the weighted portfolio LTV was. My current mix has a weighted average LTV of 69%, which tells me that I have a 31% equity cushion shielding me from potential losses. I like that margin of safety! Estimated Interest – The positions tab shows you the cumulative interest collected on each loan, but I also wanted to see the annualized interest, to get an idea of what I could expect on a forward 12-month run rate. Total – The total at the bottom has some of the data points you see at the top of the positions page, but I added this in order to see the following: Total Investment, Average LTV, Average Interest Rate, Average Duration, and Run Rate of Anticipated Interest. Note: You may be wondering why the total in the positions summary is different than the total you see in the other screenshots. This is really just timing of when I took the screenshots and when I put my spreadsheet together. I had collected additional interest by the time I pulled the spreadsheet together. I do have another portfolio with PeerStreet that has about $7,000 in it. It is an after-tax account that I set up initially before my self-directed IRA. Because the interest on these investments will be taxed at ordinary income rates, I decided that it would be more efficient from a tax perspective to make a majority of these investments in a pre-tax account, especially given the high marginal tax rate I and Mrs. GYFG are currently in. At this point, I don’t plan to add to the self-directed IRA, but rather just leave the automated investing turned on, and see how it performs over the next 12-24 months. Is anyone else investing on the PeerStreet platform? What else do you look at? 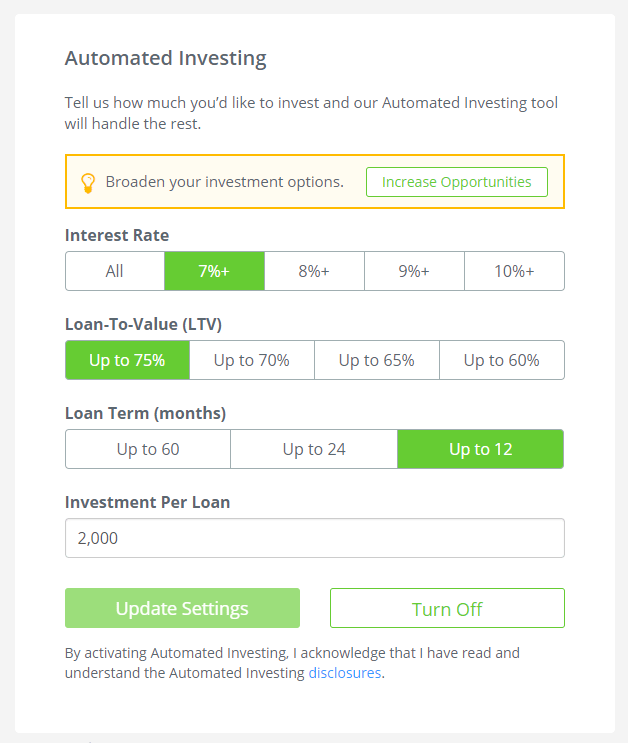 Are you using the automated investing feature? I, myself, am a PeerStreet guy. I have been more than satisfied with the returns and the risk profile that I’ve been able to build based on LTV and tenor. One loan was repaid within 3 months with an ROI of 2.47%. Can’t get that at any bank right now. Just keep rolling the interest back into new investments. Church – it will be interesting to see how investments perform through the next major downturn. The equity cushion is huge!!! I can sleep pretty soundly knowing that on average I have a 31% equity cushion + Interest collected before any of my seed capital is at risk of loss. I agree, it will be interesting to see how this platform performs with a market downtown. Like any other investment, the due diligence up front can mitigate a ton of risk, should things go south. I am sure some throw money into whatever automated investment they get into. I automate, simply, to get a priority slot in the next great investment, but quickly cancel the order if I don’t like the analysis of the property – regardless of LTV or interest rate. I thought based on the title you meant you made 77k. You meant in five months time you invested that much, right? I am interested to see how these type of investments do long term. Yes, I meant that I have invested $77,000 over the past 5 months. To date, I have earned a little of $1,200 in cumulative interest payments, but am on track for an annualized interest amount of about $5,000 between my two accounts. Nice wrap up on PeerStreet. I’ve been meaning to check them out now for some time. For me, I think I’d target a lower LTV max like 65%, only because I’m used to traditional trust deeds having a lower LTV. I guess the cool thing for you is the risk is spread out. I’ll definitely check them out soon since I have some stagnant capital lying around. Michael – This has really become my new favorite investment platform and asset class for 2017. I like the equity cushion and being in 1st lean position is the safest part of the equity stack. It’s funny you mention the LTV max of 65%, as now that I am fully invested, I have set all future investments to reinvest at a max LTV of 65%, max duration of 12 months, and a minimum 7% interest rate. I only move small amounts ($4,000) at a time to PS. This way I’m not in a big hurry to put the $ to work, allowing me to wait for the higher APR investments & lower LTVs. I’m currently averaging just over 9% APR with LTVs from 21%-70% (13 investments). Not sure if you supplied a referral link for readers to get an extra 1% yield bump on their first PS investment? Dave – that makes sense if that’s your hurdle to make investments. And yes, readers can click on any of the PeetStreet links above to get the 1% yield bump on their first investment. I’ve used automated investments only cause yield starved investors jump on offerings and it is subscribed in minutes. Can you do a post on setting up a self directed IRA. Who are the various providers, fees, complications and what criteria is used to select a particular provider. John – You are right, offerings go by fast, so automated investing can sometimes be the only way you can get in on the action. These new platforms are still working on imbalances between supply and demand. So, the $200 will be reimbursed through PeerStreet. They will also reimburse the $50 processing fee for each new transfer in, as long as it is at least $20,000. I honestly didn’t do much research beyond this. They use SD IRA Services as their partnered provider. I’ve had a good experience with Peerstreet so far. Butheir yields have dropped over the past year or so. Also heavy concentration of properties in CA. I wish they had feature to spread out risk by geography. Radcrowd – That would be a nice feature to add to the automated investing options, to spread geographical risk. 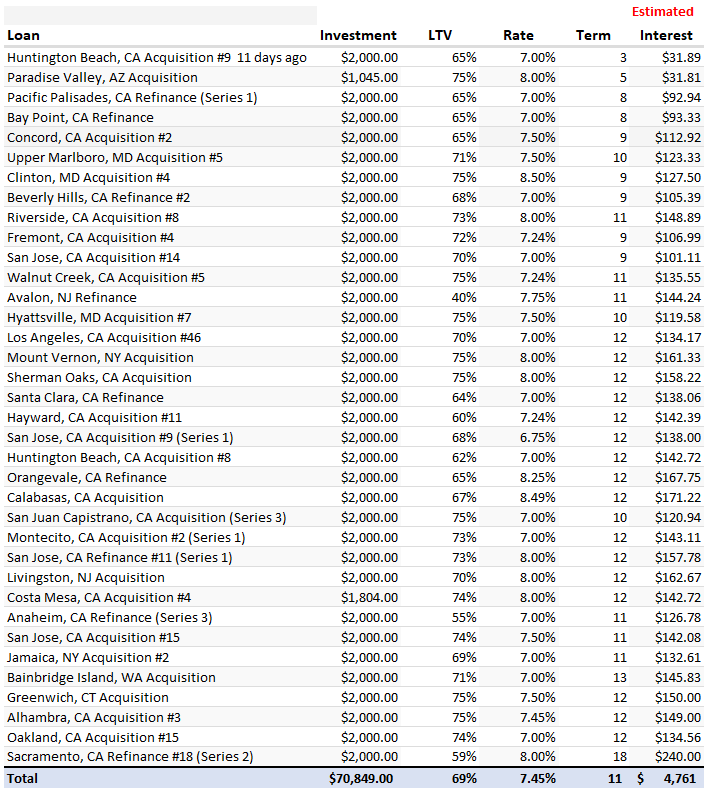 26 of the 36 investments in this particular account I shared are all in CA. Honestly, this wasn’t even something I was paying too much attention to, but I will now. I agree with the geographic concentration concern. I would love to see some of the properties in Texas, North Carolina, Alabama, and similar. It would be nice to see them add a geographic preference of filter to go with you other choices. Easier said than done when I think it out. Thanks for the detailed overview! Thanks for this – I’ve been meaning to get into crowdfunded real estate, but haven’t gotten started on the due diligence yet. A post like this helps, and I now need to figure out if I want to try it out from a post-tax account (and pay taxes at my marginal rate) or take on the extra effort of a self-directed IRA. My most recent post, http://www.mymattressmoney.com/investment-risk-when-you-think-you-know-you-dont/, goes into investment risks of various types and I make a note about geological risk – specifically Hurricane Harvey & Irma as it relates to my PeerStreet portfolio. Curious to know if you had exposure to Texas or Florida in your portfolio? If so, any updates? PeerStreet is still working on assessing the damage, based on the note they provided. Church – Thanks for sharing your recent article. None of my investments are located in Texas or Florida, so I appear to be unaffected. But if the BIG earthquake ever hits CA I would guess I would be exposed to that, since many of my investments are tied to CA property. Nice post! 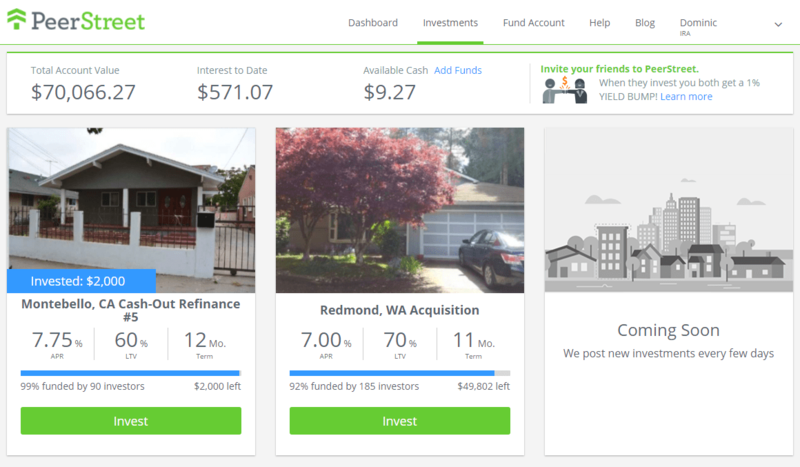 I’ve read a lot about Peer Street and so finally took the plunge and signed up… only to find out that only accredited investors are allowed to invest on their platform. Seems like I would have seen a huge disclaimer somewhere stating, “You must make $200k/year or be a millionaire to invest on Peer Street.” Ahh well… I’ll keep PS in mind for when I cross the threshold. Hey Jake – glad you liked the post! I hope PeerStreet will make this available to all investors not just accredited in the near future. It’s possible, just more paperwork, and more money. They also wanted to be sure to have a stable supply and demand, and this is one way they are able to achieve that. Another platform to check out if your interested is Rich Uncles (here is a post I recently wrote about them and my own $50,000 investment and you don’t have to be accredited).